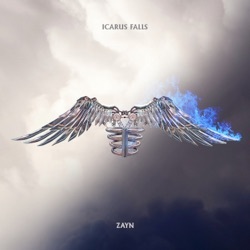 Icarus Falls is the second studio album by Zayn, released by RCA on December 14, 2018. What you have, as a whole, is a rather befuddling collection of songs. Overall, the soul-popster enthrals with his supple vocals, melodicism, and innovative production. Malik clearly wants to convey heartbreak, romance, and existentialism, and that’s harder to do when you sound better suited for whisper singing. Icarus Falls doesn't cover any new sonic ground for Malik as an artist. Zayn's return to music seems like an odyssey to get through, but it's an ambitious and adventurous unfolding of his story grappling with the spotlight and personal issues since his solo breakthrough. There are certainly decent moments, but Icarus Falls is quantity over quality. His album could be much tighter, but its downfall comes in the form of unnecessary embellishment. Once you accept the intimidating length and occasional clumsy lyric (see: “An attack of the mind / like Optimus Prime in his prime”), there’s plenty here to appreciate. Overall, this album definitely sounds like one you would expect ZAYN to put out. t’s the sound of Zayn grappling with toxic masculinity. The concept is only half-conceived, and the listening experience is repetitive and dull. Originally slated for release in early 2017, half of the tracks that make up the album are already familiar to fans while the rest will probably never leave an impression. ‘Icarus Falls’ is stocked full charisma, his signature R&B influences, and much more ambition than his first foray into a solo career. A too-long album that loses Malik’s charm in all the ideas it tries to get across. The simmering blandness of Icarus Falls is all the more surprising, given the level of anticipation surrounding Zayn’s solo career just two years ago. Across 27 tracks, he tries on so many guises—melancholic balladeer, unabashed chart-chaser, avant-pop visionary—that he fails to ever separate himself from his peers, rendering Icarus Falls a forgettable, albeit expertly produced, travelogue of R&B trends. Whatever the artistic intent, Icarus Falls remains a monstrosity -- a bountiful gift or a daunting challenge, depending on the listener -- that deserves some attention if there's time and patience to spare. Treads more of the same ground—a lot more, actually—while also serving up a few surprisingly sublime pop moments. It doesn’t come by much of a surprise that Zayn’s 27 track long sophomore record is a lengthy and monotonous affair. A 27-track mosaic to be poured over time and again, ‘Icarus Falls’ is the pop star cementing himself in the echelon of stardom. The much-delayed sophomore album, which was originally scheduled to be released in September 2017, is soulful, melancholic, tender and deeply personal. Malik will leave fans swooning with his maturing soulful falsetto, melismatic yearnings that check his heritage, and muzzy, midnight mutterings. AMAZAYN Zayn has an incredibly unique voice and amazing creativity that will take this 2nd album to new heights! Impressive I didn’t think he’d be able to outdo Mind of Mine because that album is a masterpiece but he did! He absolutely did! What a unique sound! I’m so glad I got to hear such great music. Maybe the universe doesn’t hate me that much after all. Awesome This is the best album ever! So worth the wait, so worth buying. BUY IT!!! A phenomenal album, each song has its own theme however he managed to attach the songs backstories to the theme of the legend of Icarus. You get upbeat songs, sad songs, h*e anthems and love songs that you can play at your wedding, its R&B-pop with edm and Hindi influences, he covers your every mood and there’s undoubtedly a song to play to relate to whatever your feeling. The production is amazing, the lyrics are deep but yet so endearing, his vocals are out of this world, from his low registers to his middle to his high notes and falsettos, what more do you want in an album ??? Also, 27 songs (2discs) for only 15$ ? a whole deal and sooooo worth it.